Lawsuit filed against Quigg Brothers construction for serious dump truck accident that seriously injured a daycare worker and three foster children. Trial date scheduled for late July 2019. 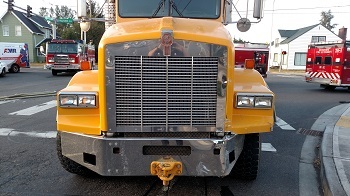 Click to accident scene photos or court filings. Injury attorney Chris Davis of Davis Law Group has filed a civil lawsuit in King County Superior Court (18 2 07722 2 SEA) on behalf of a family that was in a serious injury crash in Centralia involving a construction company dump truck. The accident that took place on a sunny August morning in 2017. Elodia Salgado was driving her three foster children to a nearby daycare center where she worked as a cook preparing meals for students and teachers. 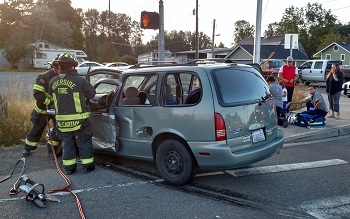 She and the children were riding in a Nissan Quest minivan on eastbound West Reynolds Road at the intersection of West Reynolds Road and North Pearl Street in Centralia, Lewis County, Washington. According to the complaint for damages, Salgado proceeded through the intersection on a solid green traffic light. She had the right-of-way. At the same time a Quigg Brothers Construction company dump truck driven by April Kimbrough was attempted to make a left-hand turn at the intersection. 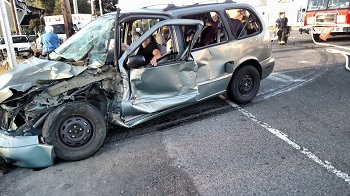 The dump truck collided into the minivan on the front driver’s side. Salgado was severely injured and suffered damages as a result of this collision. She was trapped inside her crushed vehicle (see more accident scene photos). 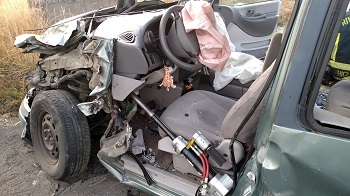 First responders from Riverside Fire had use the jaws-of-life to extract her from the minivan and transport her and the children to Providence Medical Center for emergency medical treatment. Salgado was later airlifted to Harborview Medical center where she required emergency surgery. She suffered serious injuries and lacerations to her scalp and left ear resulting in a traumatic brain injury; injuries to her left arm and elbow; and serious damage to her left knee, femur, fibula and lower leg. According to the police report, the driver of the dump truck told officers, “This is my fault…I didn’t see her.” Independent witnesses to the crash confirmed that Salgado had a green light at the time of the collision. ​Kimbrough was cited by police for causing the collision and for failing to yield the right-of-way. Quigg Brothers is an Aberdeen based construction company founded in 1937 by brothers Jim and Charlie Quigg. Today the company is still owned and operated by members of the Quigg family and employs 65-100 people in the greater Aberdeen area concentrating on highway, marine and industrial construction projects along the Washington coast. Salgado v. Quigg Bros, Inc.
Case Title: Salgado v. Quigg Bros, Inc., et al.